Ding dong! This investigation shows how your doorbell works. Have you ever wondered how an old-style doorbell works? This Snack shows you how. 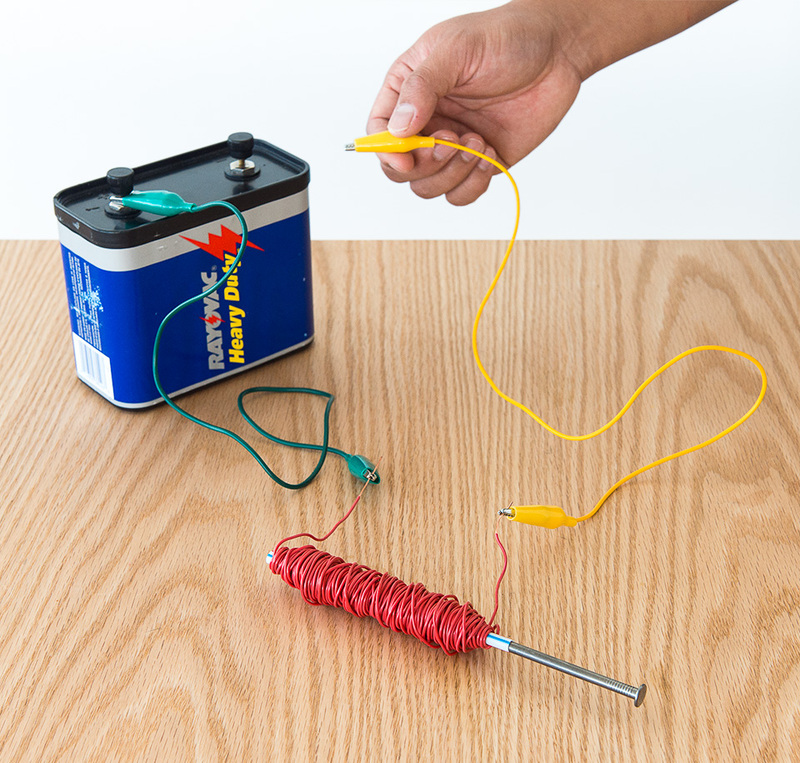 A coil of wire with current flowing through it forms an electromagnet that acts very much like a bar magnet. The coil will magnetize an iron nail and attract it in a remarkably vigorous way. Tightly wrap as many coils of wire as possible around the straw, leaving about two inches (five cm) on either end of the wire free. Use the wire strippers or scissors to strip off about one inch of the insulation at either end, exposing the wire (see photo below). Attach an alligator clip lead to each exposed end of the wire. Insert the nail partway into the coil and briefly connect the free ends of the alligator clip leads to the battery. The nail should be sucked into the coil. Make a prediction about what you think will happen if you reverse the leads to the battery. Insert the nail partway into the coil again, then connect the clip leads to the battery, this time reversing the positive and negative connections. Was your prediction correct? Any moving electric charge creates a magnetic field around it. A loop of wire with a current creates a magnetic field through the loop. You can increase the strength of this field by piling up a lot of loops. The more loops, the stronger the magnet. Like a bar magnet, this coil of wire now has a north pole and a south pole, and is an electromagnet. Because of the spin of electrons, which can be thought of as rotating balls of charge, each atom acts like a small magnet. Ordinarily, all these “loops” point in different directions, so the iron has no overall magnetism. But when you bring a nail near the south pole of your electromagnet, the north poles of the iron atoms will be attracted to the south pole of the electromagnet and they will all line up pointing in the same direction. The nail is now magnetized, with its north poles facing the south pole of the electromagnet. The opposite poles attract each other, so the nail is sucked into the electromagnet (click to enlarge diagram below). When the direction of current is reversed, the poles of the electromagnet reverse. Knowing this, you might think that a nail inserted into the coil would now be repelled by the electromagnet. But when you try it, the nail is once again attracted and sucked into the coil. That’s because all of the nail’s iron atoms reorient to line up with whatever pole the electromagnet presents. Thus the nail will always be attracted to the electromagnet and will never be repelled. You can find which end of the coil is the magnetic north pole with a magnetic compass or by using the right-hand rule: make a fist with your right hand, hold it parallel to the coil, and point your thumb in the direction the current is flowing (that is, away from the positive terminal of the battery and toward the negative terminal); your thumb will point to the north end of the coil. To extend this Snack, hold the coil vertically and repeat the experiment. Try inserting smaller nails and straightened paper clips into the coil. Remove the nail from the coil and test its magnetic properties: see if you can pick up some paper clips with it, for example. 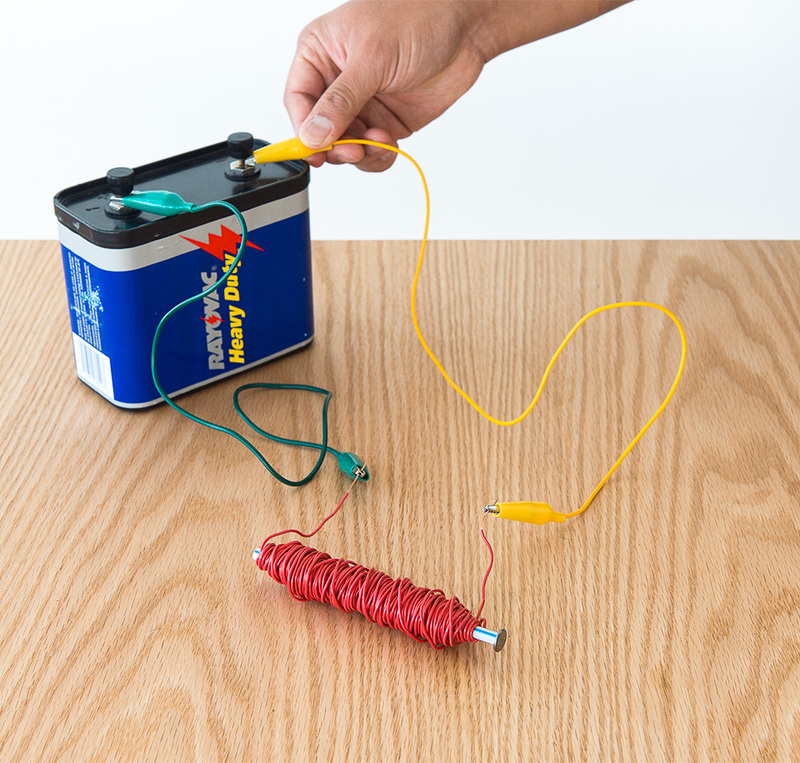 If the electromagnet is not strong enough, the nail will not stay magnetized after the battery is disconnected, so to see this effect, use as large a current source as possible. If the electromagnet is strong enough, the nail may stay magnetized for a while, until the random jiggling of the iron atoms eventually moves them out of alignment again. To demagnetize the nail rapidly, drop it several times onto a solid surface, such as a cement floor. This knocks the iron atoms out of alignment. Try to pick up paper clips with the demagnetized nail. A magnet exerts a force on current-carrying wire.